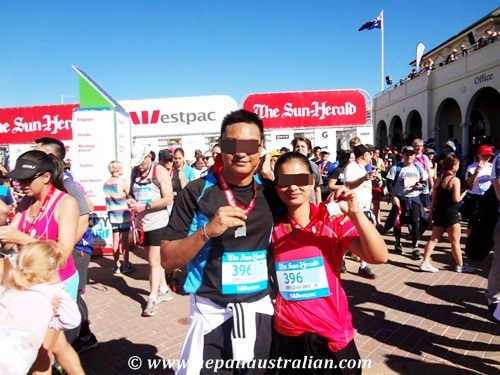 As I mentioned in my last post, we went for the City2surf 14km fun run on Sunday. Luckily, this year, unlike last few years, the weather was fine and sunny and it definitely made the run better. 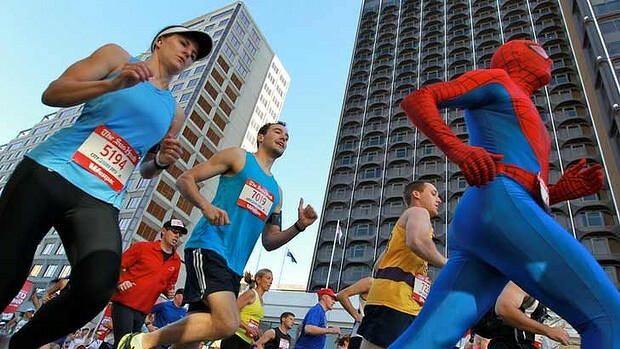 Since 1971, Sydneysiders have been joined by participants from all over the world, elite athletes rubbing shoulders with locals to run, walk, or watch the 14km race from Hyde Park in Sydney’s CBD to the finish at Bondi Beach. We normally register for the race in April. I like to think ourselves as healthy people so once we register, we go and make a plan for exercise and diet. We both are so excited and start our regime but after a few months we slack off a bit. As it is winter in June/July our enthusiasm slows down a bit. But we have managed to successful complete the run for the last few years. 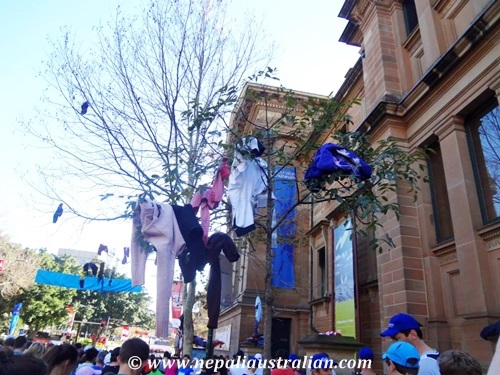 The run starts from the city centre and passes through the suburbs of East Sydney, Kings Cross, Rushcutters Bay, Double Bay, Rose Bay, Vaucluse, Dover Heights and ends at Bondi Beach. The most difficult part of the course is “Heartbreak Hill” at the halfway mark, a 2 km long steep ascent from Rose Bay to Vaucluse along New South Head Road. This year we ran in the blue group as we able to register quickly. So our run was to start at 8.30 am. We caught a train to city and joined 85,000 other runners. Like every year, just before the start of the race everyone throws their jumper so charity can collect it. It is a great idea as the runners become hot during the run but they need a jumper before they start the run. 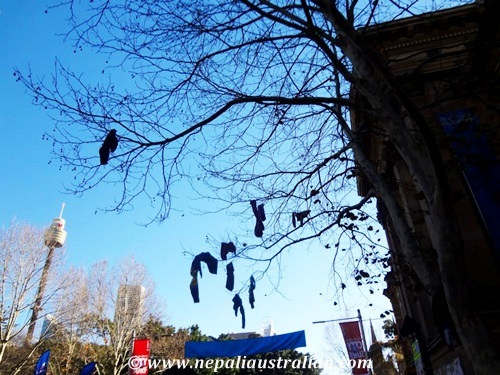 Look at some of the jumpers that landed on the trees looking like they grew on them. When the gun when off me and AS along with everyone else took our pace. This year we decided to pace ourselves so we are not too tired half way through. Therefore, we ran and walked alternatively. It really helped as I didn’t feel too tired at any stage at all. 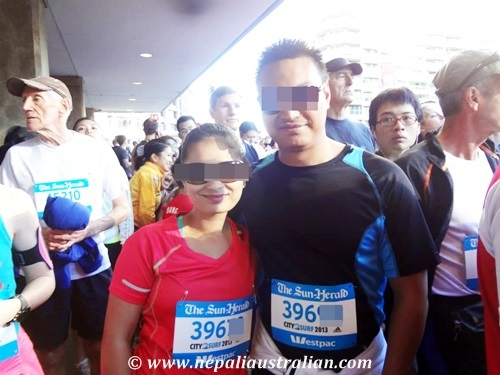 I have to thank AS for that as he knew we need some planning to complete the run easily. As every year, there were people dressing up for charities as ballerinas, smurfs, Spiderman, flash, wonder women, a pie (seriously) and people in onesies . We also had opposition leader Mr Tony Abbot running the race as the support runner for blind runner Nathan Johnston, with the pair crossing the finishing line in 1 hour 21.16 seconds for the Motor Neurone Disease Association. Like every year, there were many people cheering along the way as well as many water and Gatorade stations. There were lots of live bands and mascots as well. As it was a warm day and there were a few people hosing down runners to keep them cool. Also there were people giving away oranges, chips, lollies etc. Isn’t that nice and what a spirit to join the race. This year I felt a lot better about the run. With AS’s plan I was never too tried to have to stop. We did really well until the last 500m when AS’s leg started to cramp. But I am just proud to say that we both finished the race. It was a good feeling when we crossed the finish line and knew that it was done for one more year. 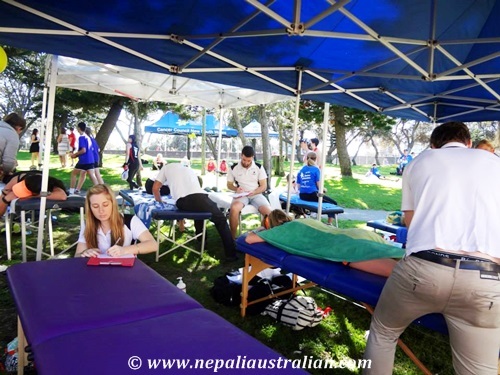 After the run, we went straight in to a Cancer council tent for a massage. For $10 for charity, they were giving 10 minutes massage and it was a great idea. Last year we missed out because we didn’t have cash but this year we made to carry cash for this. The people offering massage were university students studying to be chiropractor. After the massage, we jumped on the queue in the first food stall and had bacon and egg sandwich. We were just happy not to have to wait too long for the food. It was time to go home after the food. I have to admit, I am less sore this year than the last year and the year before. I guess the massage and AS’s techniques definitely worked for us. 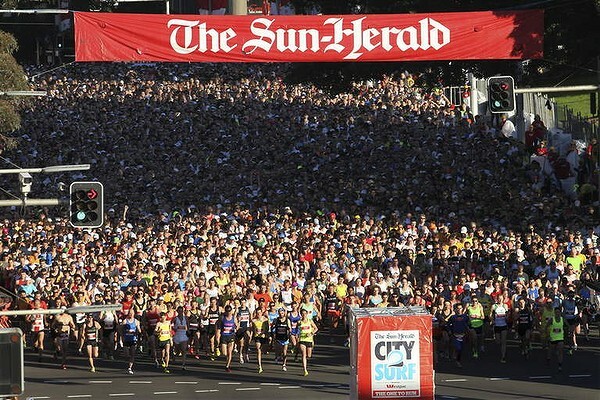 So official results for the City2Surf are in and I can be proud to say that I have beaten my last year record. I managed a time of 1:47:32, which I think is pretty decent with great experience and can’t wait to do it again next year. Do you run long distance? Share tips if you have any to become a better runner. This entry was posted in Australia, Health, Personal and tagged crossfit, health, healthy-living, heartbreak hill. Bookmark the permalink. Great you healthy people. winning also makes you mentally prepared for next season. Good luck! Congrats on the run. 14km is a solid effort. Congratulations on your run. Looks like it was a fun day. And a nice treat of a massage and egg/bacon sandwich! I was a runner for about 20 years and then completely gave it up for yoga! But in that time, I loved middle distance runs (6km was my fav) I always say mix up long runs with short fast runs and dedicate weeks to do purely strength work. Mixing it up makes it more run, less monotonous and that way you rest your body in different ways.